You may need to have your tires balanced if you experience vibration in your steering wheel or shaking and swaying while driving. Tire balancing is a specific type of tire maintenance that makes sure your tires and wheels spin more evenly. During balancing, a technician uses a high-speed balancer and wheel weights to evenly redistribute the weight of a tire and wheel assembly. This process eliminates or minimizes steering vibrations to ensure a smooth ride. It also reduces wear and tear on suspension components. For optimal tire performance and lifespan, we recommend having your tires balanced every 6,000 miles. An imbalance occurs whenever a tire and wheel assembly’s distribution of mass becomes uneven. Imbalances are common because tires and wheels are not perfectly round, despite their appearance. Placed together, the tire and wheel’s absolute center of gravity almost never matches the assembly center. This unevenness causes vibration as the assembly spins on its center against the offset center of gravity. The vibration occurs continuously as the tire and wheel spin together on either the vehicle or the balancer. There are two types of imbalances: static imbalances and dynamic imbalances. Static imbalances occur when a light or heavy spot prevents the tire from rolling evenly, causing the tire and wheel to vibrate in an up-and-down motion. Dynamic imbalances occur when unequal weight, on one or both sides of the tire’s lateral centerline, causes a side-to-side vibration. Most out of balance tires and wheels suffer from both types of imbalance at the same time. Imbalances and vibrations are commonly caused by runout, a condition created by the imperfect shape of the tire and wheel. Runout occurs when the assembly has a significantly higher point from its center than other places on the tire. Like an egg that vibrates up and down while rolling on a table, the tire and wheel also vibrate due to their imperfect circular shape. 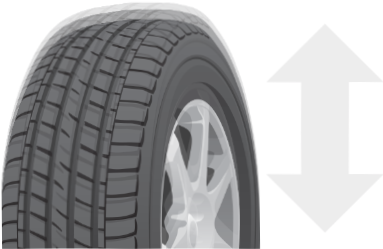 To correct this condition, the high point of the tire can be matched with the low point of the wheel. Some drivers have their tires balanced only after they notice vibrations in their steering wheel. Balancing corrects these vibrations in most cases, but it also benefits tire tread life when performed at regular intervals. Regular balancing reduces the chance of an imbalance causing irregular or uneven tread wear. Discount Tire recommends that drivers have their tires balanced every 6000 miles, instead of only after a problem appears. Balancing provides significant benefits for modern vehicles, which feature more composite materials in their construction and, therefore, weigh less than their predecessors. The heavier vehicles of previous years actually generated a smoother ride by dampening vibrations before they affected the driver, but today’s lighter vehicles do not have the weight to do the same. 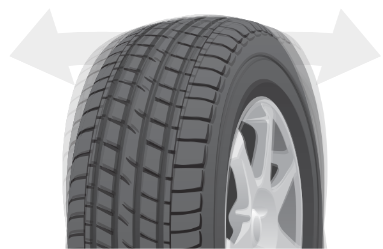 Additionally, consumer trends in today’s tire market veer toward more responsive tires with lower profiles. These stylish performance tires often feature narrower sidewalls that lack the mass to resist imbalances and vibrations. The plus-sized tires and wheels popular among today’s drivers have an even greater sensitivity to imbalances. Modern cars and tires are prone to imbalances, even to the point where half an ounce of uneven weight can cause a driver to feel a vibration. This susceptibility makes regular balancing a priority. Visit your local Discount Tire for a balancing if you notice vibration in your steering wheel, seat, or floorboard while driving at highway speeds. You may also need a balancing if you notice irregular tread wear. A technician balances a tire and wheel assembly by placing it on a balancing machine. This machine has a spindle that fits through the wheel’s center bore, and cones/adaptors that center the assembly on the machine. The machine then spins the assembly at high speeds to determine its heaviest point. Finally, the machine signals the technician where to place weights that will compensate for the assembly’s heavy spots. Technicians most often attach clip-on weights onto the lip contours of original equipment steel or alloy wheels. These weights can be made of lead, but newer wheel weights are often made of environmentally friendly zinc or steel. Many aftermarket wheels have smooth faces and delicate finishes, and they may lack contoured lips on which to clip weights. To balance these wheels, a technician places adhesive weights behind the wheel face. Some styles of wheels require both clip-on and adhesive weights, referred to as “mixed weight” balancing. Standard balancing will likely correct steering vibrations that affect the driver, but not in every case. Many other vehicle parts can be a source of vibration as you drive down the road. These include a bent wheel, an out of round tire, brake component wear, drivetrain wear, suspension wear, and suspension alignment. To help detect some of these conditions, a technician may place a tire and wheel assembly on an advanced balancer called a road force balancer. This machine performs a traditional spin balance, and also measures the tire and wheel to check for other issues contributing to vibration.